I met this adorable mama-to-be a few months ago in Denver for her photography consult. I knew right away I wanted her to be my client and just adored who she is. 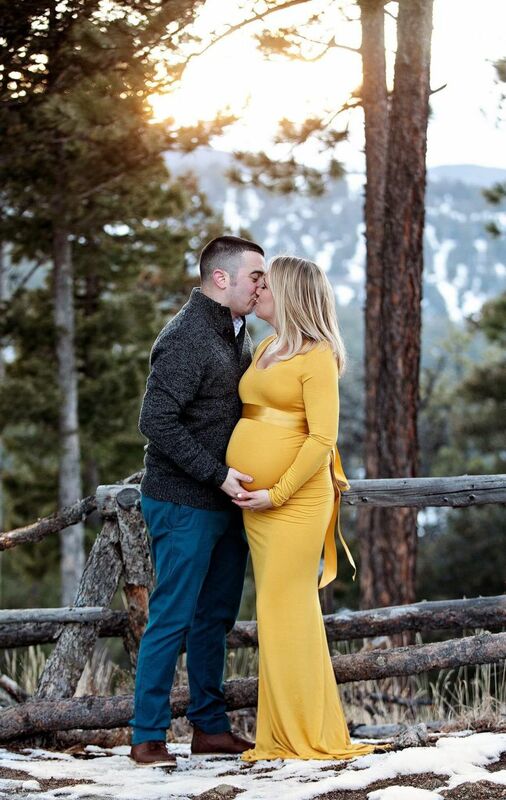 We chatted about her visions for a winter maternity session and I am so thankful that this Colorado winter finally arrived and was perfect for their session. We had just received a few days of snow and the day of their session we had a beautiful sunset with blue skies. Her gown was the absolute perfect shade to compliment the warmth of the sun piercing through the trees against the green trees and the snow covered ground. Shoots like these are the reason why I love being a Boulder maternity photographer! Sam and Hannah are as cute as they come. Sam was in absolutely awe of how stunning Hannah looked. They were so easy to work with and as you can see made my job incredibly easy. This baby is going to be cute as can be. I am so excited that they are letting the gender be a surprise!! I am so glad that I am on the “first to know” text list because I think the suspense is going to get the best of me. This baby is going to be the first grandbaby for both families so there will be a lot of spoiling in the future for this sweet little one. I had mentioned to Hannah that they might want to bring a throw in case it was cold and windy (and it WAS) that we could use for photos. She arrived with a beautifully hand-made quilted blanket that her grandfather surprised her with at her shower. Her grandmother had made this for her and the baby and it was the perfect sentimental touch to this already love filled maternity session. I am so excited to share some of my favorite images from this epic Boulder maternity photoshoot!